Garbage management in Russia has gone out of control and it will need more than urgent attention to control the situation, which now is at the level of a disaster. The legal landfills have been filled beyond their capacity, making the garbage collectors to opt to start illegal dumps. A processing industry is the only feasible solution to this menace. Mr. Sergey Donskoy who is the Minister of Natural Resources and Ecology came up with the proposal to construct a separate garbage recycling plant. An International Economic Forum was held over the past weekend, where environmental concern took the center stage. The Minister pointed out that there was a huge imbalance between the rate of garbage generation and its processing, which has brought about the accumulation of the matter, which is hazardous, and a threat to humanity. If the problem is not taken care of as soon as possible, then in the next few years Russia will be turned into a huge landfill. An example of how the situation can turn out to be the state that Haiti residents are in. Being among the poorest countries in the world, Haiti is not able to handle its waste and the residents live in deplorable conditions. It is sad to think that way of Haiti, but it is a good example to make the government officials understand how bad the situation can be. When compared to its Caribbean counterparts, Russia is in a better position to deal with the menace because it has the capacity in terms of finances, and the labor too. Until 2014 when the draft law that was prepared by the ministry will be implemented. The law is meant to centralize Waste Management, and it goes further to help in the protection of mineral resources. Only 11% of the total volume of garbage in Russia is being recycled at present. The projection by the Ministry of Environment is that in seven years to come the percentage will have risen to 80%. This will only be realized if Russia has a fully-fledged recycling industry by the year 2020. By establishing different recycling plants in different areas, the management of waste will be easier. The law was amended to allow the provision of the funds for garbage recycling. The money will be generated by incorporating the recycling cost in the cost of the product, a 0.4 % tax fee will be taken from a package based on its value. The resulting money will be forwarded to the state fund that caters for the finances of the waste processing plants. According to Mr. Sergei Donskoy, this taxation will not affect inflation in any way because it is a small amount, which cannot be easily noticed in the main cost of the products. Experts estimate that the tax will not go beyond 10% of the cost of products. Illegal dumps have increased at a high rate after the abolishment of the license that was previously being given to companies that wished to engage in the business of collection and transportation of garbage. This was noted and discussed at a meeting that was looking at how solid waste is managed at domestic levels and communal units. To counter the negative effect of the license abolishment, it was proposed that a ban would be established through legislation, for any company that will be engaging in disposal of waste matter without pre-sorting it first. To ensure that companies and individuals heed the call for control of garbage management, it was proposed that penalties be increased, which also is another form of generating revenue for the recycling of the garbage. Results from calculations that were done by specialist and social ecologists from the government showed that an average Russian generates half a ton of waste matter annually. In one year, therefore, Russia generates more than 60 million tons of garbage that comes from households. At present, only 7% of the collected garbage is recycled for reuse, and that is with the consideration that about 40% of the garbage in non-food matter like plastic, metal and glass. 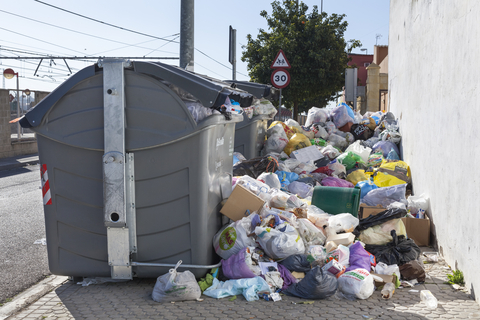 Waste Management in the European Union is more organized where programs are well coordinated to ensure that garbage is separated after collection. This enables easy selection of the recyclable material, leaving a small percentage, like 20% of the garbage going to the landfills. Garbage is an economic resource nowadays to those countries that have the capacity to turn the garbage into usable energy. Sweden, for example, has processed all its waste matter and made electricity and heat energy from it. Surprisingly, the country now wants to get garbage from its neighbors. The reduced rate of recycling of the garbage in Russia is blamed on lack of proper infrastructure. This is according to a report from the Ministry of Natural Resources. Statistics show that there are only 243 recycling plants, 53 sorting plants and 40 waste incineration plants in the whole of Russia. This is not even close to what is required to process all the garbage that is generated. The initiative that the Ministry of Environment is following the European Union guidelines on packaging. The legislative initiative encompasses the issues that might be faced by the processors and lawmakers as they implement it. The EU directs that by 2014, manufacturers will have to use the right packaging that can be recycled through composting and the use of fuel. Data from Eurostat revealed that plastic packaging waste in 15 EU countries increased from 9.9 to 13.1 million tons in a span of ten years, which is from 1998 to 2008. 40% of the garbage ended in the landfills without undergoing any processing. The EU believes that the packaging design can help in the minimization of waste and the reduction of the cost of recycling. It is easy to dispose plastic waste, which will simply be through burning, while higher prices will be experienced when the cost of recycling is included in the packaging.